In stock 156 items in stock. Sale items are not eligible for quantity discounts. Seems like no one knows how to use these LOL AWSUM. What a waste of money. It's a 4-digit 7 segment display... there's really not much to figure out beyond that. If you're using Arduino, there's a 7 segment display library that will drive it directly (you'll just have to check whether the pinout is the same). There's also dedicated 7-segment drivers that use up fewer pins of your uC but obviously add more floorspace. 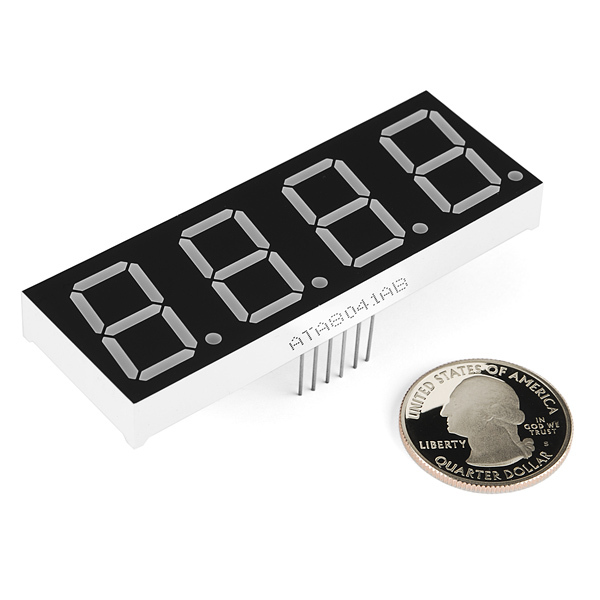 SFE has one for 8 digits, but 4-digit and single digit are easily found as well, or you could use a shift register, etc. Is there any problem in particular that you're running into? Thank you for taking the time to reply. That seven segment library will come in handy. My frustration is almost certainly born out of ignorance, though it has been exacerbated by the lack of any "next-step" information in the product description that so regularly accompanies SparkFun product pages. I'm aware of the pin count burden, so I have a couple of shift registers as well as one of those 7-segment drivers. I'm in the process of learning (I'm a software engineer by trade), so I'm reluctant to make assumptions with respect to the pinout and the datasheet is a bit cryptic. Could it be that it contains all the information I need and I am simply not interpreting it correctly? Should I just start applying 5v to various pins and see if I can't figure out the pinout myself? Thanks again! I do agree that datasheets can be cryptic at times, so let me try and clarify this one a bit because all the information you need does appear to be in there, specifically in sections 3 and 4. In section 3 you'll find a mechanical outline that also indicates the location of pin 1. 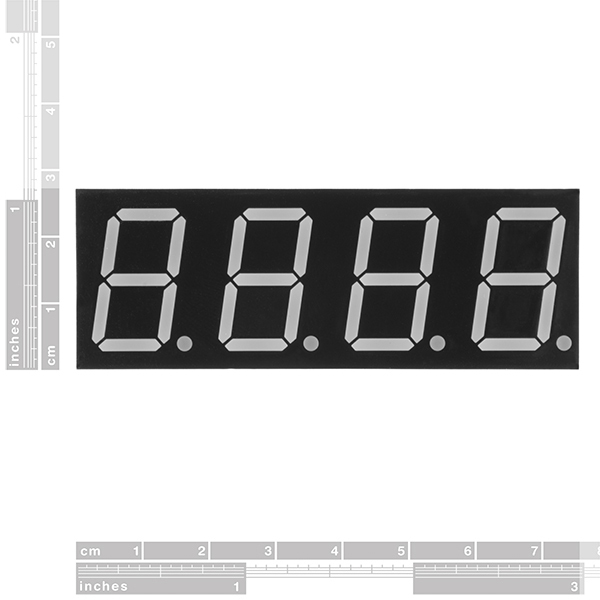 With the display facing up, and the decimal points at the bottom, pin 1 is on the bottom-left. The crossmark in that drawing is way off, but let's look past that and just go with 'bottom left'. There's two rows of pins, one at the bottom and one at the top. Pin counting is generally done in a counter-clockwise fashion. So if the pin on the bottom row on the far left is pin 1, then the pin to the right of it is pin 2, the one to the right of that is pin 3 and so on until you get to pin 6. Then you skip up to the top row, all the way to the right, that's pin 7, and then the pin to the left of that is pin 8, etc. until pin 12. Then there's the (in this case) yellow drawing of the digits with labels DIG1 through DIG4 - the digits, D1 through D4 - the decimal points, and on DIG4 there's some extra labels, A through G - the segments. Those are basically for reference. The segment labels A though G also apply to DIG1 through DIG3. Then there's the actual schematic of how this component is internally wired up. You can probably tell there's 4 distinct sections to it for each digit and also labeled as such. Let's focus on just the left-most one for now. At the top of that one you see a label "12" with below it "COM". That tells us that the pin number being indicated is pin 12 (the top-left one! ), and that's the common pin. Even without the "COM" that should be pretty easy to see as it is connected to every single LED's cathode in that group. 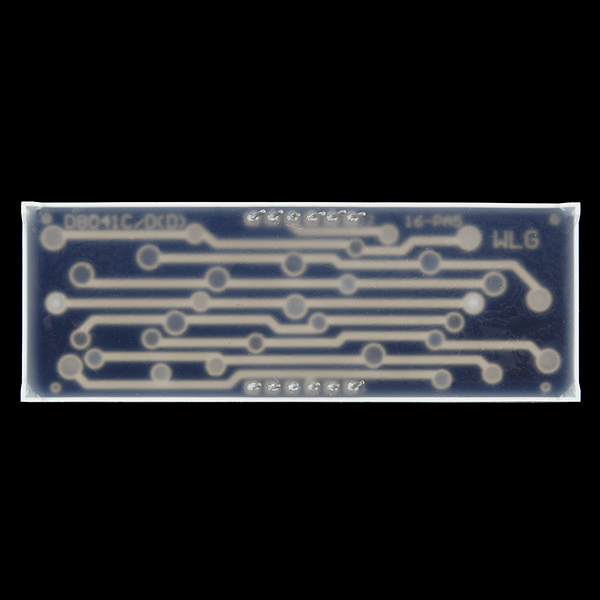 Then at the bottom you see pins 11, 7, 4, 2, 1, 10, 5 and 3, which are hooked up to the LEDs labeled A through G and DP respectively. Those A through G labels are the same labels used for the segments in the yellow drawing. If we take pin 11 (right next to pin 12), it tells us that's hooked up to segment A, and the yellow drawing tells us that's the top segment of the 7-segment digit. If we take the one next to it, pin 7, that's hooked up to segment B which according to the yellow drawing is the top-right segment of the 7-segment digit. We can go through all of those until we get to the one labeled DP. There's no 'DP' in the yellow drawing, but it's referring to the decimal point. Since we're looking at DIG1, DP in this case is actually referring to D1. Now let's say you're hooking this up on a breadboard and want to make the letter H. If you look at the yellow drawing, you'll see that you'd need segments F, B, G, E and C. If you then look at the circuit diagram, you can trace those segments back to pins 10, 7, 5, 1 and 4. So all you'd have to do is connect the positive bit of your power supply (remember to use the resistor! 1 resistor per segment would be even better.) to those 5 pins, and the negative to the common pin, pin 12. Now let's say you wanted to display the letter H on the second digit instead. If you look at the circuit diagram closely, you'll notice that pin 11 doesn't just go to segment A on the first digit, but also to segment A on the second, third and fourth digits. The same applies to the other segment pins. The only one that actually changes, is the common pin - instead of connecting the negative power supply to pin 12, you'd connect it to pin 9 instead. 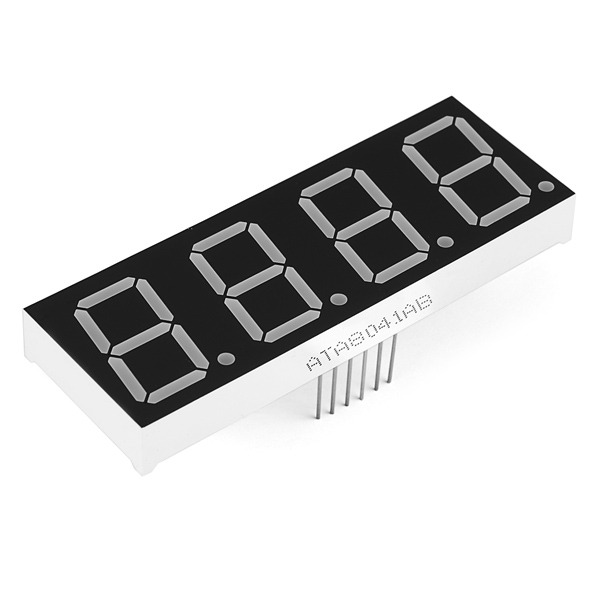 If you try this on your breadboard, you should notice that the first digit goes out, and the second one displays the 'H'. The same thing applies to the third and fourth digits - the segment pins remain the same, only the common pin changes. 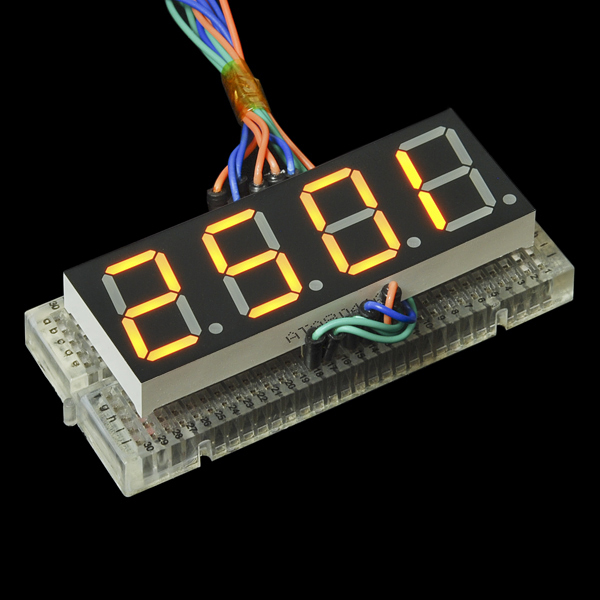 This is also how most of these multi-digit displays are driven by a microcontroller. Rather than applying power to each digit simultaneously, they just cycle through the 4, powering each digit one at a time by changing which common pin gets to be connected to the power, and changing the segment pins' states at the same time in order to display, say, the time, or some rudimentary text. Thanks for your lengthy reply - it's proven invaluable! You might clarify in the descriptions of these (and blue and other colors) that 1" is the package height - the illuminated character height is 0.8". These are yellow-orange, close to what HTML "gold" looks like. It's actually a very pleasing color. Why not? :) You can find drivers for both common anode and common cathode, and e.g. the Arduino platforms will happily (well.. 'happily') source OR sink current on their I/O pins. I agree that it would be nice to offer both - and also offer a common anode equivalent of the 8-digit driver SFE carries.